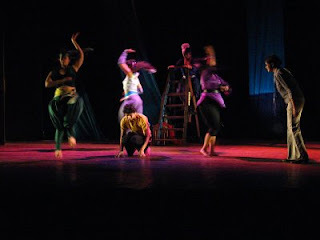 The preview show of Ranan’s forthcoming dance and theatre staging of Peter Shaffer’s play, Equus, was staged at Gyan Manch on Friday, 27 March 2009. Among the invited audience were noted theatre personality Shri Shyamanand Jalan, well-known dancers Smt. Rani Karnaa and Smt. Chetna Jalan, Dr. Reimar Volker and Mr. S. V. Raman - Director and Programme Officer of the Goethe-Institut, Kolkata respectively, arts writer and editor, Ms. Anjum Katyal and translator and editor, Ms. Sudeshna Banerjee. The response has been overwhelmingly positive. The Equus team will now spend the next two weeks honing the production and working on specific feedback from the preview show in order to make the experience better still. 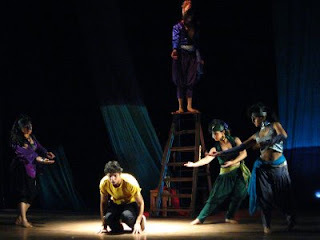 We hope many of you reading this will be able to attend the premiere run of shows at Gyan Manch, Calcutta, 6.30pm – 10, 12, 17, 18, 19 April 2009. Tickets @ Rs. 60 will be available at the hall from Saturday, 4 April 2009, 1pm to 7pm.